So tonight we visited Tillys new school, it was nice to be able to meet the staff and a few of them even remembered us from the older kids being there about 10 years ago. I didn't really know what to expect as i am so out of practice with the whole school thing, but We entered the hall and we were directed to the appropriate teacher who introduced herself and gave us loads of information and a book bag for Tilly. Inside her book bag she was over the moon with a copy of Green Eggs And Ham, which Kimmy read to her when we got home. We also got a chance to trial the school dinners, which was handy as i had just come from work so i was hungry. 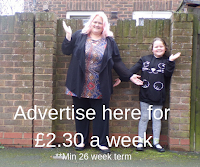 I had thought about letting Tilly do school dinners but i had quickly dismissed the idea as i really cant afford them, but then when we were getting the talk we were told that all children are entitled to a free school dinner from September. this is such a relief, as i don't get home from work until 7pm sometimes and its too late for her to eat a meal. After an hour of Tilly singing through the presentation, before pulling a home made belt up over her boobies and prancing around provocatively ( i seriously cant take her anywhere lol ), we were taken to the class rooms. The thing that struck me first was how big the classrooms were, there is so much space for them to enjoy, explore and learn in. Tilly went into the garden and i am sure she thought she was at some kind of holiday park as there was so much to do out there, it was painful trying to drag her away at the end of the evening! Next week we have the staying session at school, where we go for an hour to see the school working. After tonights visit i do feel more hopeful and confident about sending her to school.